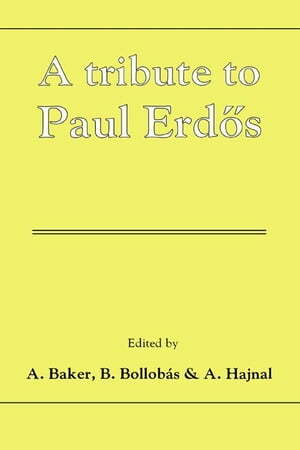 Collins Booksellers - A Tribute to Paul Erdos by Baker, A., 9780511899232. Buy this book online. This volume is dedicated to Paul Erdos, who profoundly influenced mathematics in the twentieth century, with over 1200 papers in number theory, complex analysis, probability theory, geometry, interpretation theory, algebra set theory and combinatorics. One of Erdos' hallmarks was the host of stimulating problems and conjectures, to many of which he attached monetary prices, in accordance with their notoriety. A feature of this volume is a collection of some 50 outstanding unsolved problems, together with their 'value'! Eminent mathematicians from around the world have contributed articles to this volume that reflect the diversity of Erdos' interests, and it will be a fund of insight for number theorists, combinatorialists, set theorists and analysts.